While Shepherds watched their PIES by night. Remember the Matthew Walker 'The Pudding' Challenge? 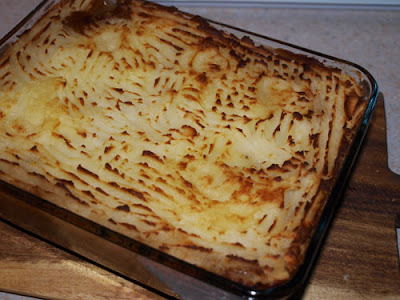 When I have some roast lamb left over I always like to make a Sherherd's Pie, I wasn't very sure what it would be like with the fruity pudding stuffing, but whizzed the lot in the food processor along with a raw onion. Poured over some gravy and topped with mashed potato. It was pretty tasty, DH really liked it although I think I prefer my Shepherds Pie without a hint of dried fruit sweetness! oh looks great my lil one would eat the lot well not all of it! Very nice! I can't say that I have had a good shepard's pie in years. I think the hint of dried fruit was a nice touch. Chocolate Muffins - this time they're real!